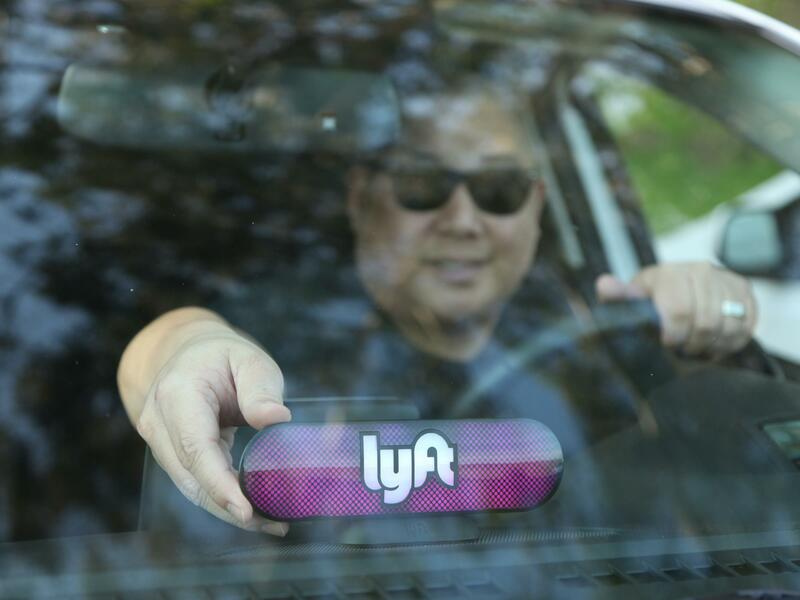 A Lyft driver places a company emblem on his dashboard Jan. 31, in San Francisco. Lyft announced it's offering education benefits, a move aimed at recruiting and retaining drivers in its competition with Uber. Shanae Watkins, a driver based in Baltimore, would like to become a social worker. She is currently working on her bachelor's in psychology through online classes. "It's better that way with my kids," she says. "I can drive or study while still being present at home when they need me." Drivers can take English as a second language and GED courses, as well as earn an associates, bachelor's or master's degree online in subjects including IT, nursing, social work, occupational therapy and business. Gabe Cohen, general manager for Lyft in Denver, says internal surveys show that drivers want to earn degrees. This move serves that goal, as well as the startup's business interests. Guild's other clients include the fast-food chain Chipotle which, Weintraub says, has seen a clear benefit to retention: 98 percent of the employees who enrolled in its education programs stayed with the company over a 90-day period. David Weil, dean at Brandeis University's Heller School of Social Policy and Management, is not impressed. Weil, who was in charge of investigating companies that misclassify workers under the Obama administration, describes the move by Lyft as strategic, but not generous. "The ride-hailing companies can't erase the fact that their business models are having drivers do all sorts of things an employee would do," Weil says. To offer training is "really nice" but it doesn't mean Lyft should "be rewarded by having the other responsibilities removed," he says. The ride-sharing company Lyft announced an education program for its drivers today. Lyft will offer access to discounted online GED and college courses. The move is an interesting experiment in the gig economy, where a growing class of workers receive no benefits from a boss and yet competition for their time is fierce. Here's NPR's Aarti Shahani. SHAHANI: Does that interest you? WATKINS: Yes, it definitely does. SHAHANI: Watkins, a single mom raising three kids in Baltimore, is working on her bachelor's in psychology, taking online classes. WATKINS: I want to be a behavioral health therapist. I really feel like that's my calling. SHAHANI: She also drives for Uber, GrubHub, Amazon Flex and pretty much feels no loyalty to any of them. It's all about earnings. But if this new education benefit saves her money, she says, she would certainly drive a lot more for Lyft. She's excited. WATKINS: I am excited. Like, as soon as we get off the phone I'm probably going to Google and see what I can read up and what the requirements are on it. SHAHANI: In this new program, drivers get tuition discounts - 5 percent to 20 percent. And the company says the average driver getting a degree saves more than $4,000 dollars a year. Drivers can get an associate's, bachelor's or master's degree online in subjects like IT, nursing, social work, occupational therapy and business. They can also take English as a Second Language classes or get a GED. GABE COHEN: Those who are successful in business listen to their customers. And, you know, in many ways drivers are our customers. SHAHANI: Gabe Cohen is Lyft general manager in Denver. It's a funny paradox in the gig economy. On the one hand, companies like Lyft and Uber claim their workers are contractors who are not entitled to benefits. They fight tooth and nail in court to defend that position. On the other hand, these companies desperately need more drivers, so are trying to figure out what benefits they can offer to appeal to working people. Cohen says this education program is very much an effort to recruit and retain drivers. Uber offers nothing comparable for now. COHEN: The companies that stay true to their values and their mission ultimately will end up being successful. SHAHANI: David Weil, dean at Brandeis University's public policy school, is not impressed. He believes that many Lyft drivers are being misclassified, that they are employees entitled to benefits. And he says Lyft is just doing what many, many employers do. DAVID WEIL: It's a respectful thing for an employer to do for the people who work for them. But I would certainly not in any way give them a pass on the broader issue of how they treat that workforce and how they classify that workforce just because they're providing these benefits. SHAHANI: Lyft audited the pilot program to make sure it does not open the floodgates to new legal claims that workers are employees. In-house lawyers determined it doesn't because only benefits that serve as compensation, like health care, could put the independent contractor status in jeopardy. And note - Lyft is an NPR sponsor. Aarti Shahani, NPR News, San Francisco. Transcript provided by NPR, Copyright NPR.